Today November 5th is the official book launch of 12 Weeks to Self-Healing: Transforming Pain Through Healing Energy by Dr. Candess M. Campbell, PhD. See what special gifts are being offered today only for the book launch from Candess and her friends and associates. Click here. Candess M. Campbell, PhD has been treating clients for over 30 years. You now have access to her healing tools and in this process can begin your healing in the privacy of your own home! 12 Weeks to Self-Healing guides you through an easy and effective process of healing your emotional and physical pain. 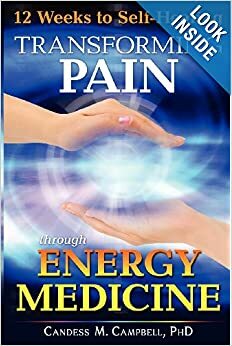 It educates you on cutting-edge techniques within the field of energy medicine. Now you can activate your body’s healing; transform and heal with step-by-step guidance; learn journaling, self-hypnosis and meditation; integrate cutting-edge energy medicine tools and shift your beliefs toward self-healing and abundant living! Do you have a friend or a loved one who suffers from emotional or physical pain? With 12 Weeks to Self-Healing they will be able to integrate the body, mind and spiritual tools to gain freedom, increase their passion and live more fully!